This new Hubble image shows spiral galaxy ESO 137-001, framed against a bright background as it moves through the heart of galaxy cluster Abell 3627. This cluster is violently ripping the spiral’s entrails out into space, leaving bright blue streaks as telltale clues to this cosmic crime. This new Hubble image shows ESO 137-001, a galaxy located in the southern constellation of Triangulum Australe (The Southern Triangle) — a delicate and beautiful spiral galaxy, but with a secret. This image not only captures the galaxy and its backdrop in stunning detail, but also something more dramatic — intense blue streaks streaming outwards from the galaxy, seen shining brightly in ultraviolet light. These streaks are actually hot young stars, encased in wispy streams of gas that are being torn away from the galaxy by its surroundings as it moves through space. This violent galactic disrobing is due to a process known as ram pressure stripping — a drag force felt by an object moving through a fluid . 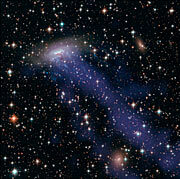 The fluid in question here is superheated gas, which lurks at the centres of galaxy clusters. This image also shows other telltale signs of this process, such as the curved appearance of the disc of gas and dust — a result of the forces exerted by the heated gas. The cluster's drag may be strong enough to bend ESO 137-001, but in this cosmic tug-of-war the galaxy's gravitational pull is strong enough to hold on to the majority of its dust — although some brown streaks of dust displaced by the stripping are visible. Studying ram pressure stripping helps astronomers to better understand the mechanisms that drive the evolution of galaxies. For example, it will leave this galaxy with very little of the cold gas that is essential for star formation, rendering the galaxy effectively incapable of forming new stars. ESO 137-001 is part of the Norma Cluster, a cluster of galaxies near the centre of the Great Attractor, a region of space that earned its name by being so massive, and having a gravitational pull so strong, that it is pulling entire galaxy clusters towards it. This region is located around 200 million light-years from our galaxy, the Milky Way. Both our galaxy and its home group, the Local Group, are slowly being hauled towards this mysterious region. Hubble also imaged ESO 137-001's neighbour, ESO 137-002, which is also known to have a hot tail of gas extending outwards into space (potw1302). Despite being relatively close by cosmic standards, catching even a glimpse of the Norma Cluster is no mean feat. Observed from Earth, the cluster lies close to the plane of the Milky Way and is obscured by a thick smog of cosmic dust. But Hubble is up to the challenge — using new data from Hubble's Wide Field Camera 3 (WFC3). As with most images from Hubble, this is not just a pretty picture; it tells us a great deal about the harsh environment at the heart of a galaxy cluster, and the fate of galaxies like ESO 137-001 that find passage through it. A quick and simple analogy for this effect would be to imagine leaning out of a car window as it travelled quickly along a motorway, or walking within a swimming pool. 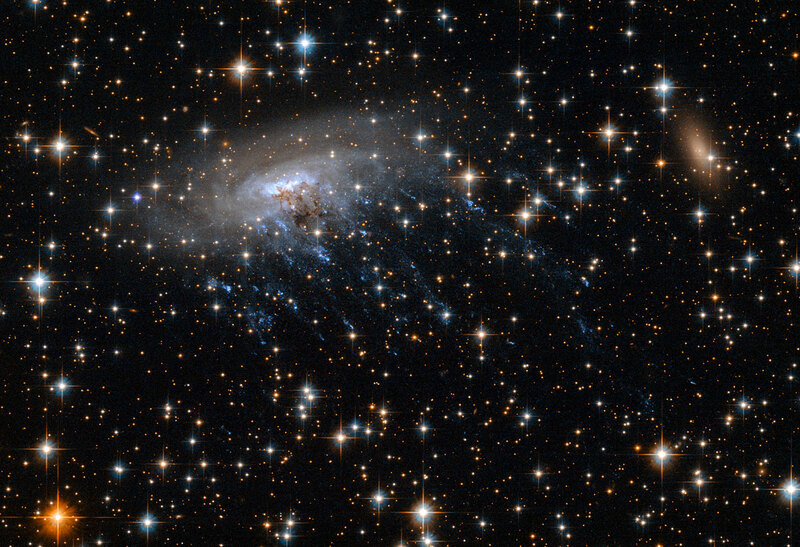 The data for this image comes from HST project 12377, with prinicipal investigator Ming Sun.